Closed New Years Day, Good Friday, Recreation Day and Christmas Day. Brewery tours are available Wednesday to Sunday at 12pm and must be booked and confirmed at least 48 hours prior. LAUNCESTON / TAMAR VALLEY – Davies Grand Central, St Johns Craft Beer Bar, Red Brick Ciderhouse, Balmoral on York, Stillwater Restaurant, Crown Cellars, Moores Hill Winery, Quamby Estate, Harvest Market (about once a month). The Seven Sheds Tasmanian Brewery and meadery is located on a property in Railton, in Tasmania’s north-west, comprising, you guessed it, seven sheds. After purchasing the property in 2003, owners Willie Simpson and Catherine Stark opened this Tasmanian brewery in 2008. 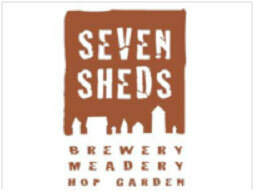 Seven Sheds beers are distinguished by their artisanal, “hands-on” approach and small-batch brewing methods (1,000 litres or less per brew) using traditional brewing techniques including open fermenters and a secondary fermentation in the bottle and keg. Inspiration comes from many sources including English and Belgian beer styles and locally-sourced ingredients such as quinoa, organic oatmeal, ginseng, berries and stone-fruit. Tasmanian barley and hops are featured in most of the brews, including Leggett and Fuggle hops grown on-site. Inspired by the Belgian Trappist ales, a great brew to enjoy while strapped to your favourite armchair. Seven Sheds also produces the oak-aged Royal Willie; St Ella India Pale Ale; chocolate-infused Black Inca; and seasonals including Stark Raven Oatmeal Stout; Fuggled Porter; and Kentish Cherry Saison.